Now that the spring sun has finally come to break apart winter’s last remaining snow, it seems time to get back out on Monadnock’s beautiful terrain and do some hiking. Monadnock is chalk full of different hiking locations running the gambit from leisurely strolls to difficult climbs for those looking for a challenge. No matter who you are the area has a climb for you. We couldn’t think of a better, low cost way to enjoy the new warm weather. 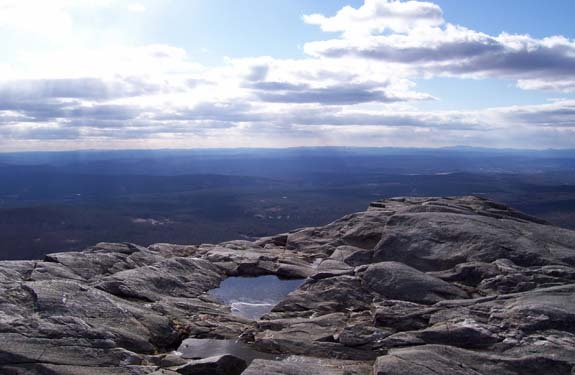 So here’s our list of the top 8 hikes in Monadnock. Hedgehog Mountain divides east and west Deering New Hampshire and is one of our more relaxing hikes. At just over 3/4 of a mile, hiking Hedgehog Mountain is a perfect trip for those looking for a shorter hike. It normally only takes 2 hours round trip. But, the short time doesn’t take away from the breathtaking spectacle of Hedgehog’s summit that overlooks the Contoocook valley. 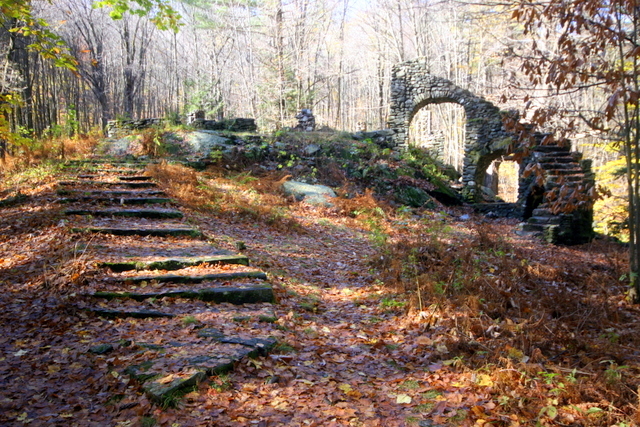 Though the castle was burned down 1962, the remains of the grand staircase and fireplace still stand. So adventurers looking to experience the purportedly hunted ruins and take in the beauty of the forest itself should consider the Ann Stokes Trail, which its located on. The short loop trail of two miles offers more than just views Madame Sherri’s Castle but also the serenity of Indian pond and its surrounding forests. The area has more to offer than just the castle, too. There’s the Daniels Mountain Trail, a 3/4 mile hike over small streams, through the beautiful forest and up to the summit of Daniels Mountain. With tons of variety and a lot to see, Madame Sherri’s forest demands at least one stop this spring. The Chesterfield Gorge Natural Area is a gorgeous geographical wonder. The area’s focal point is three part slopping cascades that compose one waterfall. Along its half mile path, visitors can take in the gorge itself, its 70-foot high walls, the river that carved it out of the land and the woods the frame it. Moreover, if you’re in the mood to slow down, many visitors fish the gorge itself. Or you can just slow down and dip a toe in the cool, refreshing water. The Wapack trail is the oldest public, interstate hiking trail in the US. Its 21 mile trail crosses between North Pack Mondadnock in Greenfield, New Hampshire all the way to Mount Watatic in Ashburnham, Massachusetts. 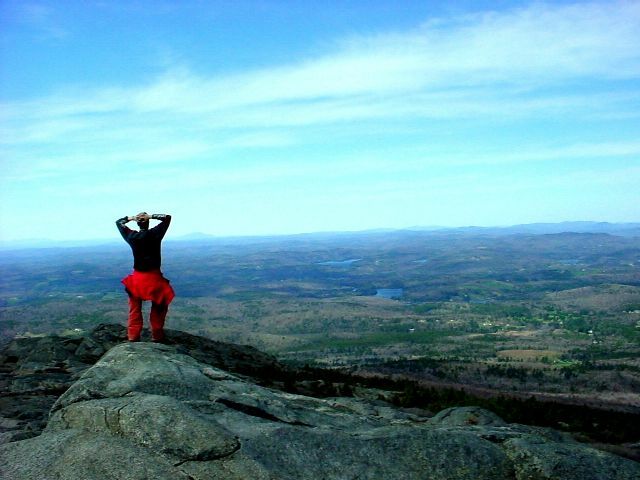 The scenic hike gives an unprecedented opportunity to take in the Monadnock skyline. Windblown Mountain in New Ipswich offers access to the trail beginning in late April once all of the snow has melted. The Wales Preserve trail is a 4.5 mile hike at about 1000 feet above sea level. The hike gives visitors access to the Gridley River also known as McCoy’s Sabbath Day Trout Creek, which slopes through the trail, punctuated by a series of small cascades. On one of the river’s many island, grows the area’s largest tree: a white pine, measuring 34 inches in diameter. From the white pine, to hemlocks and red maples, there is plenty of luscious forest to take in over the trail. The Harris Center Trails are a system of trails based in Hancock, New Hampshire. The center offers three distinct trails: the west side trails, the east side trails and the Kulish Ledge trails. The west side trail takes visitors on a 2 – 4.5 mile rather demanding round trip (depending on the actual course) up Mount Skatutakee. The east side trails offer a more easy one mile hike to a huge glacial boulder within the forest. And the Kullish ledges offer a 3 mile trip that includes two spectacular vistas. The Harris Center Trails is filled with a lot of variety for experienced hikers or people looking for a more leisurely experience. Mount Monadnock is the most climbed mountain in the United Sates for good reason. Combining a series of different trails ranging from 2 miles to over 4, the mountain offers a wide variety of challenge options. For intermediate and beginner hikers, The White Dot and Toll Road trails are going to be best, offering a gradual scenic hike. For more experience hikers, the Spellman trail is going to the right choice as it is very steep and rock the entire way. No matter the path taken, Mount Monadnock grants hikers a spectacle like no other. Rising alone above the region that bears its name, Mount Monadnock’s summit is blessed with unobstructed views of all of southwestern New Hampshire. Hiking that much is going to help you work up an appetite so make to go out to any of the area’s amazing restaurants or stop in to get some ice cream. And if you are wondering to do after a day on the mountain, check out our calendar to see what’s going on that day. Now get out there and hit the trail.